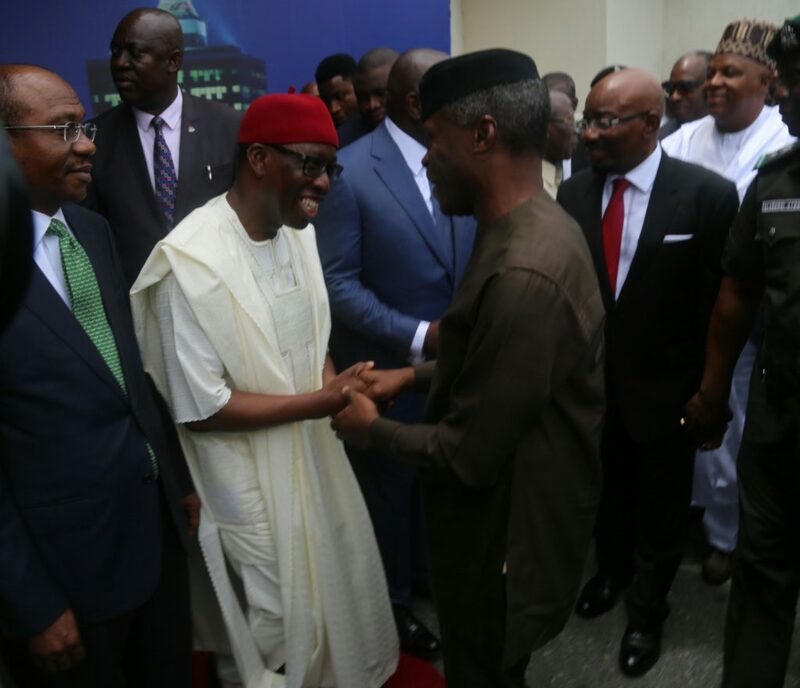 NIGERIA’S Vice President, Prof. Yemi Osinbajo, Delta State Governor, Senator Dr Ifeanyi Okowa, billionaire businessman, Alhaji Aliko Dangote, erudite scholar, Dr Christopher Kolade, among others on Monday, September 17, 2018 graced the launch of the book, ‘Africa Arise and Shine’, authored by the founder and Chairman of Zenith Bank Plc, Mr Jim Ovia, where they observed that Africa was making steady progress. Speaking at Lagos where the event took place, Prof. Osinbajo observed that the fact that democratically elected Presidents are in charge of all the countries in Africa was a clear testimony that Africa is making progress. “It is not about how the figure looked in the first few days, it is about character, integrity, fidelity to service over self,” the Vice President stated. The governor who attended the event with such Deltans like the Dein of Agbor, HRM Benjamin Ikenchukwu Keagborekuzi I, members of the National Assembly, among others stated that the book will inspire Africans to always aspire to bring out their best. Chairman of the occasion, Dr. Christopher Kolade had in his opening speech, said the book by Mr Ovia was an opportunity for Africans to tell their own stories, noting that the description of Africa as a dark continent was as a result of outsiders telling the story of Africa. “Africa was described as a dark continent and I am happy that I am not leaving this world believing that Africa is a dark continent; one problem with Africa is that other people tell our stories and I am happy that one of the brightest is telling the Africa story and it is remarkable that Jim Ovia is telling his own story and I believe it is an interesting story for us to read,” he said. Different personalities including State Governors, the Governor of Central Bank, Mr Godwin Emefiele, Alhaji Aliko Dangote who was represented by his daughter, Halima, Mr Akintola Williams, Mr Tony Elumelu, Asiwaju Bola Tinubu, Folunronso Alakija, Chief Tony Momoh, among numerous others read different passages from the book and also, spoke glowingly about how Mr Ovia grew an enterprise of N20 million to more than 16 billion dollars.